Most people are familiar with vacuum cleaners, but they do not know about another carpet cleaning option, the carpet sweeper. However, as we will see below, carpet sweepers are actually older than both vacuums and carpet cleaners. If you are interested in a unique appliance that will clean your carpet, then continue reading, for we will give you all the information you need to purchase one, including a list of the best carpet sweepers on the market. What is a carpet sweeper? Do I need a carpet sweeper? Before discussing how to find a good carpet sweeper, let’s define the appliance. This product acts like a broom for your carpet. It is usually not motorized and have to be pushed manually across the floor. But, this means that they are much quieter and lighter than vacuum cleaners. Carpet sweepers usually have a long handle with a small box at the bottom. The box holds the rotating brushes and a dirt container. This popular carpet sweeper design was patented by Melville R. Bissell, the founder of Bissell, in 1876. Even today, Bissell carpet sweepers are the industry leader. The carpet sweeper has many advantages over a traditional broom. First of all, it will clean carpet easier than a broom—which was designed to clean hard floors. Secondly, a carpet sweeper has the dirt collection box as a part of the apparatus. This means that you do not have to find a way to throw away all of the dirt your carpet sweeper removed from the carpet. The appliance itself does this. Despite their many advantages and long history, carpet sweepers are not well known in this country. Carpet sweepers actually have a long history, as they were first patented in 1876. Most people are not aware of them nowadays because they were largely replaced by the vacuum. But, at the time of their introduction, they were a huge time and labor saver. Before carpet sweepers, a person had to take their carpet outside and beat it in order to get it clean. This meant that you couldn’t have wall-to-wall carpeting in your home. It also meant that the process of cleaning a carpet was time consuming and extremely hard work. Additionally, the cost of the carpet itself was quite expensive. It was not until the Industrial Revolution in the middle of the 19th century that carpet throughout a home became an affordable option for most people. As carpet became cheaper and more common, new ways for cleaning it had to be invented. Enter the carpet sweeper. However, once electricity made it possible to design and appliance that mechanically sucked up the dirt in your carpet quicker and more efficiently, the carpet sweeper began to go out of style. Other than in old movies, it is unlikely that you will see a carpet sweeper in most homes or popular culture. But, some believe that the carpet sweeper legacy lives on in robotic vacuums, which use suction as well as rolling brushes to remove dirt from carpets. The question of whether you need a carpet sweeper depends on your habits and how much mess is made on your carpet. If you have a good vacuum, you can clean up most of the messes that will befall your carpet. However, vacuums are large and cumbersome. A carpet sweeper is perfect for small, dry messes—they cannot clean up liquids—that need to be cleaned immediately. If you have small children that drop food on the floor, a carpet sweeper may be right for you. In fact, most people mention their use in combination with a food environment, like dropped chips in the dining room or cleaning under tables in a restaurant. There is also a big difference between manual carpet sweepers and electric carpet sweepers. Choosing one type of carpet sweeper over another is another very personal decision. Electric carpet sweepers keep the brushroll running even when they are not being moved, which makes them more efficient in pulling up all the dirt from a carpet. But, these types of appliances need to be plugged in and will make noise, which may make them less ideal for some households. To sum up, you may want to consider a carpet sweeper if you often have small food spills or other similar messes. An electric or manual carpet sweeper may also be right for your home if you want a quiet appliance that can be used immediately without having to drag a vacuum all over your home. It is completely legitimate and common to own both a carpet sweeper and a vacuum. But, if you only want to purchase one or the other, you should understand the major differences between these two carpet cleaning appliances. As stated above, a carpet sweeper is quieter and lighter than most vacuums. This allows you to clean up a mess instantly without any trouble. And, most people can lift and push this appliance, so anyone can use it. A vacuum, with its use of suction, is a much more efficient and quick mess cleaning machine. Plus, it can be used on carpet and hard floors, which makes it more versatile than the carpet sweeper. Even so, vacuums need to be plugged in and are typically heavier and harder to move than a carpet sweeper. If you are on the fence about purchasing a carpet sweeper, here are the most important pros and cons to be aware of. They are quiet, which makes them perfect for houses with small children, animals that frighten easily, or anyone else that should not be disturbed. Manual carpet sweepers don’t use power, so are ideal for people living off the grid or without access to a power supply. They can be used immediately, so no waiting to clean up those chips on the floor until you can go and get the vacuum, plug it in, and drag it to the location. Carpet sweepers are much more affordable than vacuums since they involve fewer moving parts and have no electrical wiring. They are not great for big carpet cleaning jobs. Because most carpet sweepers are not electric, cleaning all of the carpets in your home with them will require a lot of time and effort. A vacuum can handle a carpet sweeper’s job, so many people may opt to just keep one carpet cleaning appliance in their home. Just because the carpet sweeper is a fairly simple piece of equipment, does not mean that all models are the same. If you are in the market for a carpet sweeper, there are a few things that you will need to keep in mind as you make your purchase. Probably the largest consideration you will need to make when making a purchase is whether you want a manual carpet sweeper or an electric one. Manual carpet sweepers have to be pushed along the carpet to work. But, electric carpet sweepers use electricity, so will keep the brushroll spinning even if the carpet sweeper is not in motion. While electric and manual carpet sweepers will both clean your carpet, electric models tend to be a little more efficient. However, they are also the noisier option and they require electricity to work, so they will not be a good fit for off-the-grid homes. Your choice or electric vs. manual carpet cleaner will ultimately depend on your own preferences and how you plan on using the appliance. Some carpet sweepers will come with a variety of accessories or features. Added accessories are less common with this product than vacuums, as there are not hoses to attach additional cleaning heads on a carpet sweeper. However, you will occasionally find included accessories. Carpet sweepers often come with a variety of features like using all recycled plastics, a lack of PVC, or having no disposable products. Additionally, many carpet sweepers from different manufacturers use very varied cleaning brushes. We recommend doing your research on the types of features and accessories that are available with carpet sweepers, decide which ones are right for you, and then searching for carpet sweeper models that have those specific features and accessories. Again, without the moving and electrical parts of a vacuum or carpet cleaner, a carpet sweeper is much easier to maintain and keep in good working order. But, in case you need after-sales services or have to replace the product, it is always best to buy a carpet sweeper with a warranty. Most manufacturers offer warranties of one to three years. In addition, to ensuring that you purchase a carpet sweeper with a warranty, you also need to read and fully understand the warranty that comes with your product. Know whether there is any action or product that will negate the warranty. Knowing this information up front will help save a lot of headaches later. In general, carpet sweepers are one of the quietest carpet cleaning products on the market. However, this does not mean that they are silent. Electric carpet sweepers will make some noise from the motor and other moving parts. These sounds will be similar to those made by a vacuum. On the other hand, manual carpet cleaners are quieter, but they too will make some noise. You will likely hear parts rubbing together or the brush moving on the carpet. Always make sure to try out a carpet sweeper before you buy it to know whether you can tolerate its specific noise level. This Bissell carpet sweeper illustrates why the company has been such a presence in the carpet sweeper world since Melville R. Bissell designed the first carpet sweeper in 1876. Bissell’s Natural Sweep Carpet and Floor Sweeper has a dual brush rotating system and four corner edge brushes. The plentitude of brushes ensures that your carpet will get amazingly clean every time you use the carpet sweeper. In addition to the many brushes in this carpet sweeper’s design, the product is also made without PVC, it is made from 100% recycled plastic parts, and does not include any disposable products. In short it is a great choice for environment and health conscious consumers in addition to being one of the most compact, light, and effective sweepers for carpets, rugs, and hard floors. Finally, it comes with a soft bumper so that no furniture or walls will ever get harmed by using this appliance. The Fuller Brush Electrostatic Carpet and Floor Sweeper has a nine-inch cleaning path. This make it an extremely portable appliance while also allowing it to have amazing cleaning power. Like the Bissel carpet sweeper, the Fuller Brush Electrostatic works on both carpet and hardwood, which makes it extremely versatile. If you need to pick up pet hair, crumbs, dust, debris, paper clips, or glass in small quantities, this is the product for you. Another feature that sets the Full Brush Electrostatic Sweeper apart from other products is its use of an electrostatic charge. This charge is created by the natural bristle rotator brush and ensures that this carpet sweeper is extremely efficient and will clean any floor in your home. Shark’s Ultra-Light Cordless Rechargeable Floor and Carpet Sweeper is the only product on our list that is not a manual carpet sweeper. It has a motorized brush roll and Shark claims that it will sweep any size or type of debris. There are even two motor speeds and will run for fifty-five minutes without having to be recharged. The lack of power cord on this electric carpet sweeper makes it highly desirable. And, of course, there is the shape of the carpet sweeper itself. It has a low profile, which makes it easy to maneuverer around and under furniture. Plus, the handle folds to make it easier to store. Another Fuller carpet sweeper, the Workhorse is a commercial carpet sweeper model. It has indestructible metal housing and a rubber bumper guard to protect furniture and walls. Also, the cleaning path is seven-inches wide and is reversible. This makes it easily maneuverable. The brushes on this carpet sweeper do not have bristles, so this is not a manual carpet sweeper that can be used on any flooring type. It is designed for carpet only. While you will often see this Fuller carpet sweeper in professional establishments, that does not mean that it can’t be used in your home. In fact, being a commercial model means that the Workhorse will bring professional carpet sweeping directly into your home. Our final pick for the top five carpet sweepers is Rubbermaid’s Commercial Galvanized Steep carpet sweeper. This product has a low-profile design to fit under furniture easily. It has a smaller width at only six and a half inches. But it does come with a rubber protective bumper. The aspect that sets this carpet sweeper apart from the other models is Rubbermaid’s use of galvanized steel and ABS plastic. Both of these materials are heavy duty and durable, which means that this carpet sweeper will be around for a lot of years to come. Carpet sweepers might be simple to use—you just push them across the mess you want to clean up—but to get the most out of them, there are a few things to keep in mind. Below we’ve listed the steps you should take to properly use your carpet sweeper. Always empty the dust collection bin before you begin using the carpet sweeper. This will give you the most dirt collection space available and make your cleaning experience more enjoyable. Hold the carpet sweeper by the handle and push it over the dirty area on your carpet. If you have a manual carpet sweeper, the action of pushing will cause the rollers to move and collect the dirt into the included container. If you have an electric carpet sweeper, you need to plug in and turn on the appliance before you begin using it. This will begin the movement of the rollers. Hold the carpet sweeper at the top of its handle, so that you do not have to bend over. Then push the appliance over the dirt on the floor. Make sure you are pushing in a straight line and overlapping each pass. You may need to push the carpet sweeper over a particularly dirty area multiple times to fully clean up the mess. Always empty the dirt collection bin when you are done with the carpet sweeper. When you take the time to complete this step, you will know that the dirt collection bin will be clean for the next time that you need your carpet sweeper. Because a carpet sweeper is such a simple and straight-forward machine, it is very easy to keep it clean and in good working condition. Just do the following things to keep your carpet sweeper with you for years to come. The best thing you can do for your carpet sweeper is to empty it regularly. If the dirt builds up in the container it will stop the carpet sweeper from working effectively. Always begin your cleaning with an empty dirt collector. If you want to keep your carpet sweeper looking its best, you should wipe it down regularly with a wet rag. Having an electric carpet sweeper will mean more maintenance, as there are wire and other moving parts that could fail. Inspecting your electric carpet sweeper regularly will prevent you from missing a problem that could ruin that machine. Carpet sweepers can make small cleaning jobs much easier. Carpet cleaners should be an essential part of your carpet cleaning regimen along with vacuums and regular carpet cleaning. By purchasing one of our top picks for the best carpet sweeper, you will always have the correct tool for any carpet cleaning job. 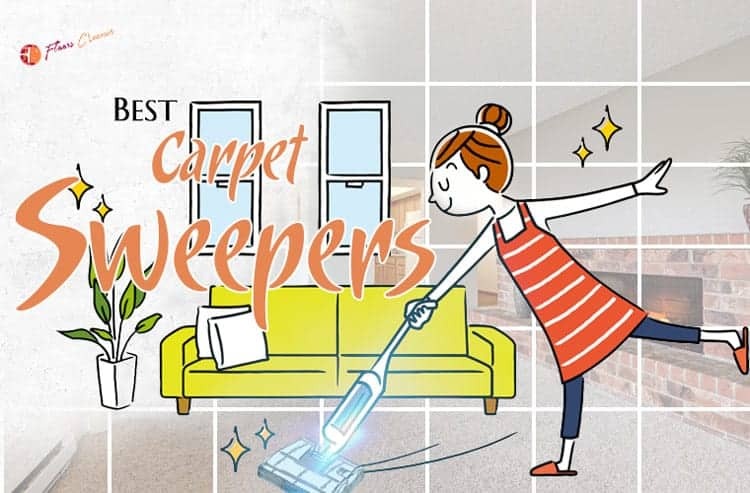 Since most people are not as familiar with carpet sweepers as they are vacuums and carpet cleaners, make sure to read through our handy buyer’s guide. In it we teach you everything you need to know about carpet sweepers and what to look for in your ideal carpet sweeper. In this article we have given you all the tools you need to keep your carpet clean and like new for years.